Every one of San Diego’s 1.3 million people — and all the other people in Southern California too — will some day need a dentists. Many will turn to traditional dentists who cause them pain and increase their fear of dentistry, making them wish they’d never gone to a dental professional in the first place. A few lucky people, however, will meet Dr. Daniel Vinograd, the holistic dentist San Diego residents who’ve visited him know they can trust. For Dr. Vinograd, dentistry is just one part of overall health. As a dentist since 1978 and an advocate for safe, non-toxic, biocompatible and amalgam-free dentistry since 1980, Dr. Vinograd has built upon a strong educational background in holistic dentistry. In addition to training in Mexico as a dentist and naturopathic doctor, his American doctorate in dental surgery came from the University of Southern California in 1978. He now teaches prothodontics at USC as an associate professor. Dr. Vinograd also has a Bilingual Secondary Education Teaching Credential, awarded by San Diego State University in 1992. 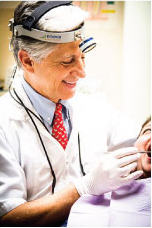 He keeps sharp on the latest procedure through a variety of continuing education programs and class, and he maintains professional membership in a number of organizations, including the International Academy of Oral Medicine & Toxicology, the International Association of Mercury-Safe Dentists and the International Society of Dental Anxiety Management. participate in spiritual practices like yoga and meditation to improve their overall state of wellbeing. He’s always sharing with his patients his latest findings as well as important hints and tips aimed at improving their specific oral health and overall health circumstances. And it goes without saying that he’s very careful about what he puts in people’s mouths to avoid toxicity issues down the road while giving them the best possible quality of work. Even if you live elsewhere in Southern California, it might be worth the drive to beautiful San Diego to visit the biocompatible dentist San Diego residents are privileges to have in their town. While you’re visiting the city, you can enjoy the famed San Diego Zoo, Sea World and get to know the Spanish and Mexican heritage of the town at one of the many historic sites. And go ahead and spend a few minutes relaxing on a beach too. You’ll have nothing to worry about and feel great after you’ve spent some time with Dr. Daniel Vinograd, the holistic dentists San Diego can be proud of.